An angler fishes the Alagnak River. 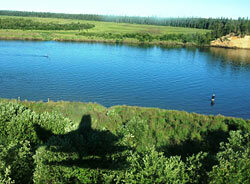 Fish and wildlife habitat occurs on federal, State, and private lands. Birds, mammals, and fish range over these habitats without regard to ownership. ADF&G staff participates in federal and State land use processes and actions to recommend the conservation of important habitats and to assure the the public has opportunity to enjoy fish and wildlife resources.